As it goes about its regular activities a wombat is likely to suffer some minor accidents and injuries. Claws broken while digging and cuts on the foot pads from sharp stones and thorns are probably common occurrences. 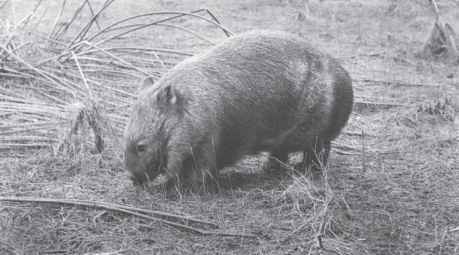 The wombat's habit of pushing its way through whatever lies in its path - thick undergrowth, tangled fallen timber and brushwood - rather than taking an easier if longer route, must make it prone to accidental sprains, breaks, cuts and abrasions, particularly as this bulldozing method of travel is often carried out at considerable speed. All these wounds, as well as those acquired while fighting or inflicted by dogs or dingoes, may become infected. The wombat appears to be highly susceptible to bacterial infections. These have been found to be hard to treat in captivity, but the wombat has its own 'bush' remedy, and that is to plaster the wound with a thick layer of earth. I have often seen a wombat with an open wound on some part of its body - head, rump, flanks or belly - deliberately lie down and roll in a patch of exposed earth, so that the soil sticks to the wounded area. Whether the resulting 'mud pack' has any healing properties I do not know, but it does serve as a fly-proof screen while the wound beneath it heals. Wombats suffering from mange also frequently plaster the affected areas with mud or clay in an attempt to relieve the intense itching of this disease.